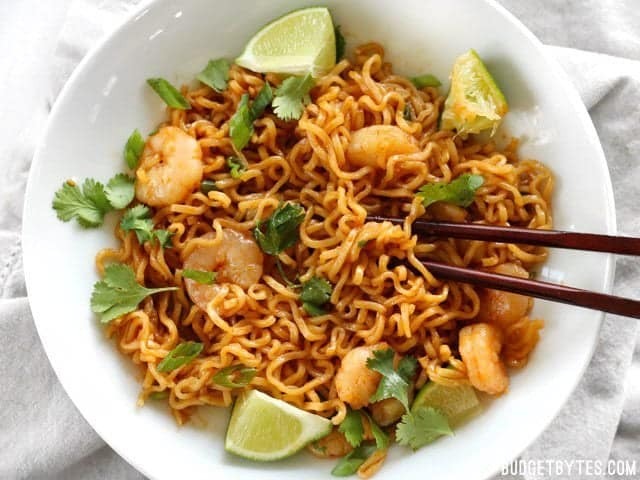 This version is a great demonstration of three ways to customize the original recipe: switch out the protein, use a different type of noodle, and add to the sauce. So, I used shrimp for protein instead of egg this time around. 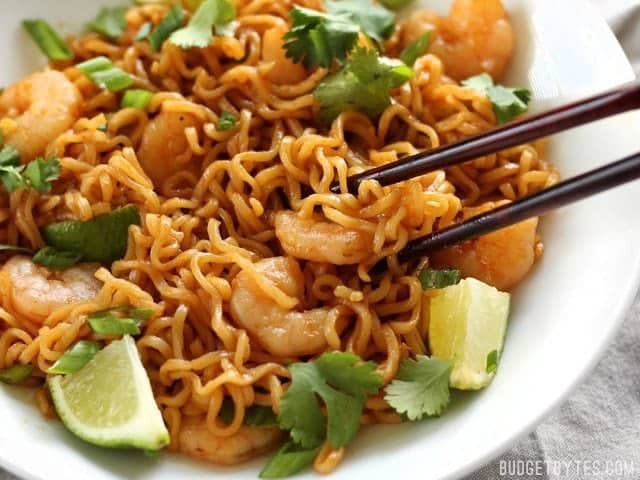 While shrimp are just as easy to cook as eggs, they can be a little more expensive, so I also switched out my favorite wide lo mein noodles for a less expensive ramen (because once they get drenched in that spicy sweet sauce, who cares what kind of noodle it is, gnome sayin’??). 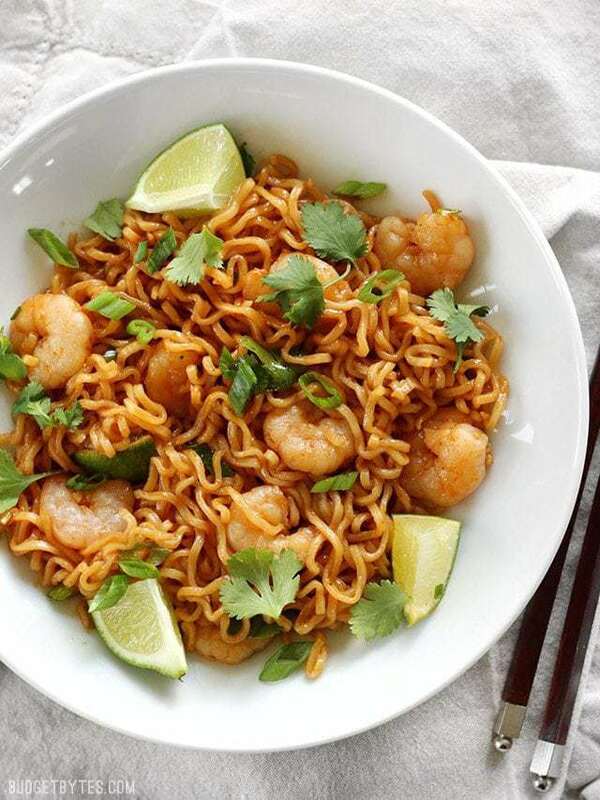 Finally, I added some fresh lime juice to the sauce (and served it with wedges for squeezing over the noodles) to add freshness and help highlight the seafood flavor. It’s a winner winner (budget) shrimp dinner! 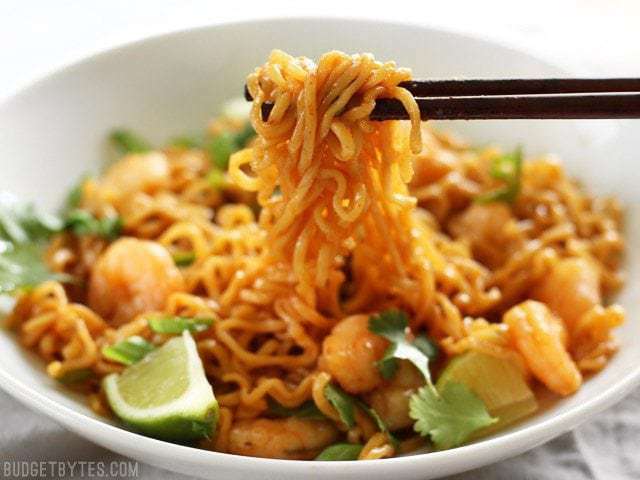 Lime Shrimp Dragon Noodles are a fast, easy, and inexpensive alternative to take out. This version features tender shrimp and fresh lime. 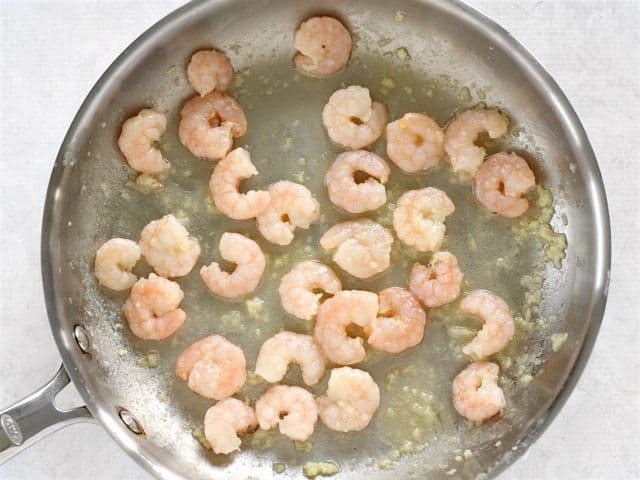 Place the shrimp in a colander and rinse with cool water until thawed. Let the shrimp drain until ready to use. 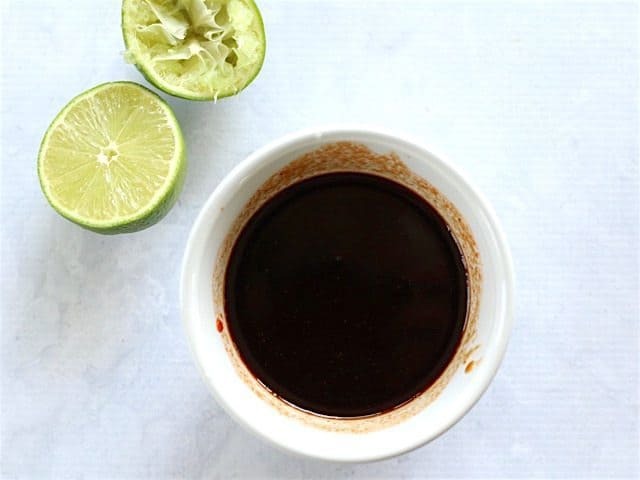 In a small bowl stir together the sriracha, soy sauce, brown sugar, and about 1 Tbsp juice from the lime. Set the sauce aside. Fill a medium sauce pot with water, place a lid on top, and bring to a boil over high heat. 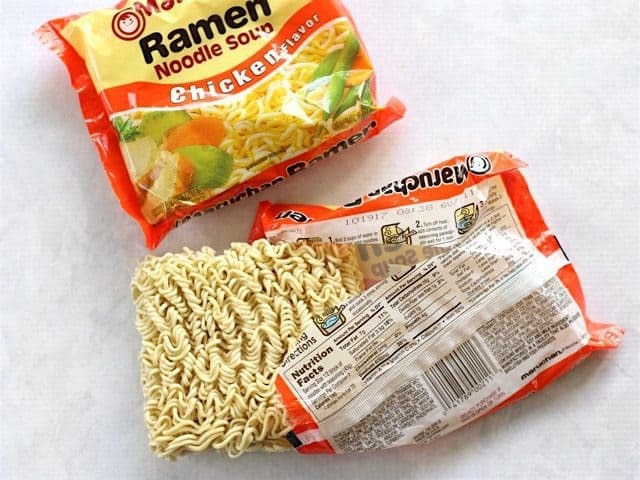 Once boiling, add the ramen noodles (without the flavoring packet) and continue to boil until the noodles are tender. 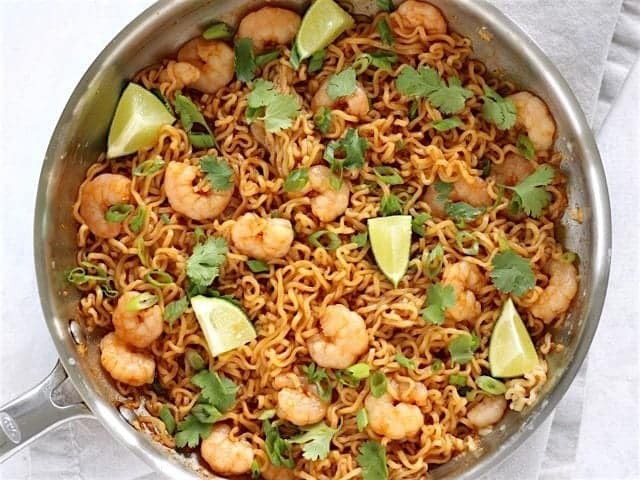 Drain the noodles in a colander (if using the same colander for the shrimp, make sure to wash it with soap and water first). While waiting for the water to boil, mince two cloves of garlic. Add the butter and garlic to a large skillet and sauté over medium heat until the garlic is soft (about one minute). Add the shrimp and continue to sauté until the shrimp turn pink and opaque (about 3-5 minutes). Remove the skillet from the heat. 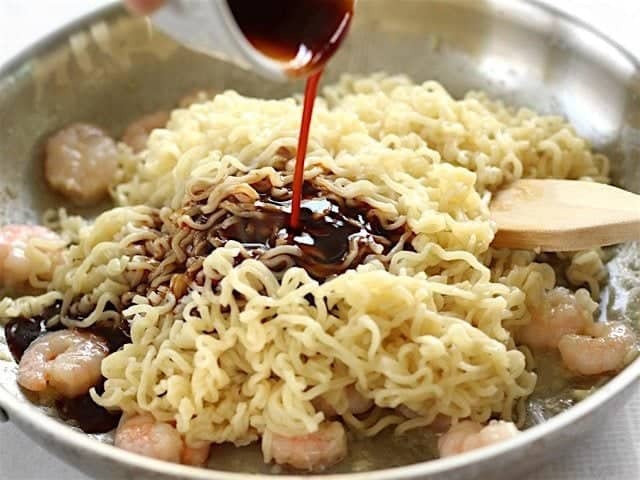 Once the noodles have drained, add them to the skillet with the shrimp, then pour the prepared sauce over top. Toss the noodles in the sauce until everything is coated in sauce. Top the dragon noodles with sliced green onion, fresh cilantro leaves, and a squeeze of lime. Defrost 1/2 lb. of frozen peeled and deveined shrimp. They defrost quickly if you place them in a colander and run cool water over them. Let them drain until you’re ready to use them. I used 51/70 size, which I found to be just right for the noodles. 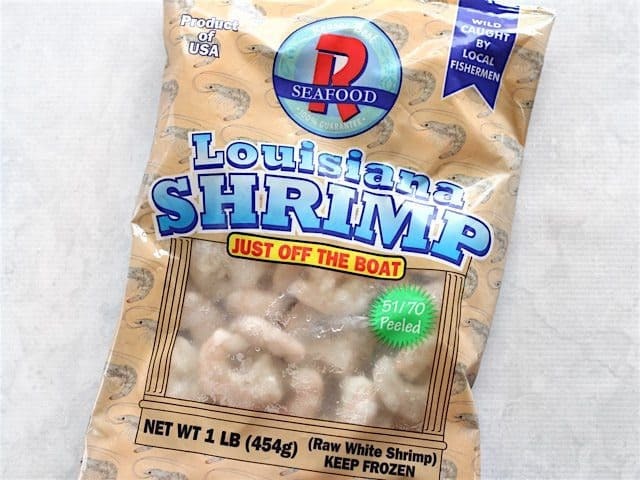 “51/70” means there are on average between 51 and 70 shrimp per pound. Next, prepare the Dragon Noodle dressing so it will be ready to go when you need it. In a small bowl stir together 2 Tbsp sriracha, 2 Tbsp soy sauce, 2 Tbsp brown sugar, and about 1 Tbsp of lime juice. Save the rest of the lime to serve as wedges with the meal. 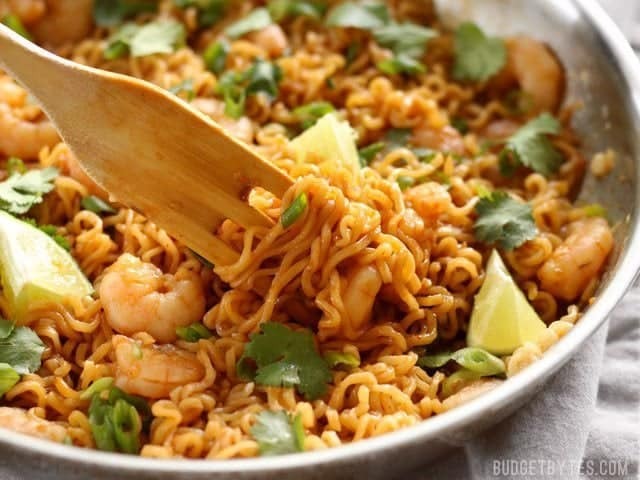 Bring a medium sauce pot full of water to a boil, then add two packages of ramen noodles (without the seasoning packet). Boil the noodles until tender, then drain in a colander. 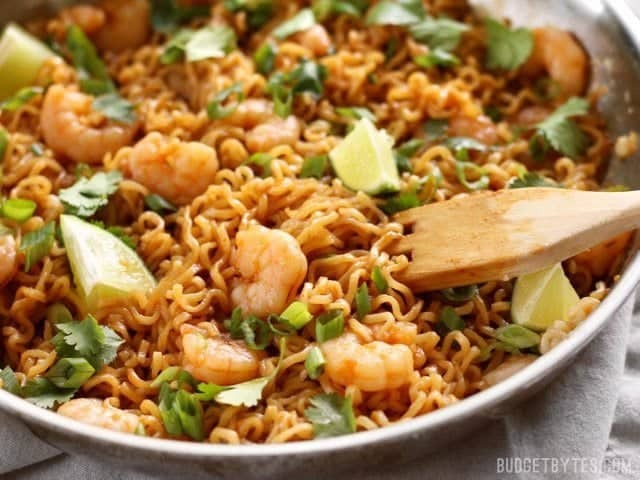 If you use the same colander to drain the noodles as you used to rinse the shrimp, make sure to wash it out with soap and hot water first. While you’re waiting for the water to boil, you can continue preparing the shrimp. 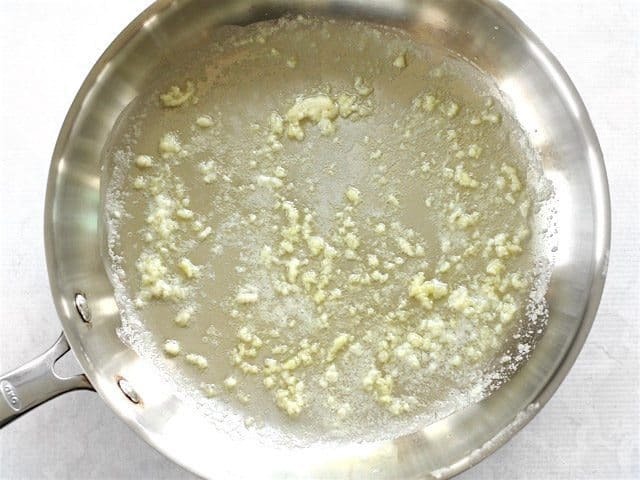 Mince two cloves of garlic and add them to a large skillet along with 2 Tbsp butter. Sauté the garlic in the butter over medium heat for about a minute, or just until it softens a bit and gets really fragrant, but doesn’t brown. Then add the thawed and drained shrimp and continue to sauté until they turn pink and opaque. Shrimp cook really quickly, so this should only take a few minutes. If you continue to cook them, they will shrink and become very tough, so remove the skillet from the heat at this point. Finally, add the cooked and drained noodles to the skillet and pour the sauce over top. Toss the noodles in the sauce until everything is coated. 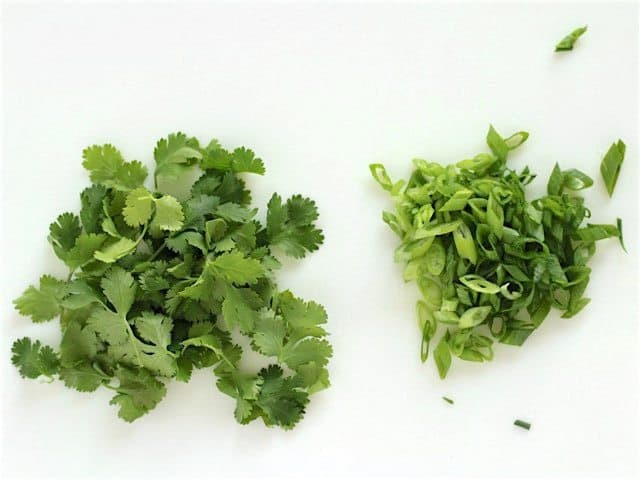 Slice up a couple of green onions and pull a handful of cilantro leaves from the stems. Sprinkle the green onions and cilantro over the noodles. Cut the remaining lime into wedges to serve with the noodles. This is like magic. Just a few ingredients and so little effort to put together, and quite tasty. I use gluten free pad thai rice noodles instead of ramen. This recipe is so delicious. I made it a month ago and the kids love it. I’ve been asked to make this at least 3 other times! I might try it with eggs this next time around but the shrimp was very good with it! I even passed this recipe along to a coworker. I have most of these items in my home weekly so it was a good choice! Delicious! I subbed garlic chili sauce for the Schiracha. (less than the schiracha as we don’t love super spicy), and subbed a skinny soba type noodle for the ramen. Otherwise, I followed the recipe and we have no left overs! Win Win! Always delicious recipe,s. This one is a keeper! Thanks Beth! Excited to try this one! Any suggestions on adding veggies? I’m thinking spinach and maybe broccolini, but would love to hear your suggestions! Made this last night and my husband absolutely devoured it. I didn’t happen to have ramen noodles so I tried it with what I had in the pantry, which was linguine, and it still worked. I made double the sauce because it’s just that ridiculously delicious 😋 I love your recipes, Beth—I’m not a good cook and I’m not confident in the kitchen by any stretch, but your directions and step-by-step photos are so easy to follow and I’m usually very successful when I follow your recipes! I made this tonight and while it had really good flavors, I think it could be better with udon noodles or at least something better than Top Ramen. Will definitely made again, though. 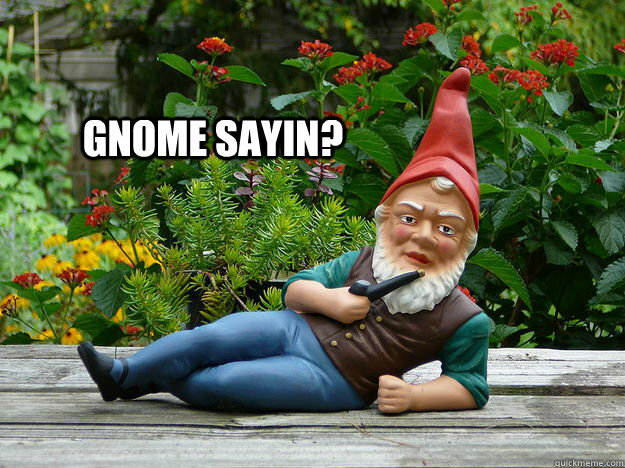 Thanks for posting, this is great! I added onion and celery and topped with peanuts! Loved it!